Ever since I ran my marathon birthday – 26.2 miles on my 26.2th birthday – a few years ago, I’ve been running my age in miles for every birthday. This year was 30. The crazy highlight this year was seeing this amazing rainbow in Golden Gate Park. It’s going to be a good year! Can you believe this insane rainbow?! Ever since I ran my marathon birthday – 26.2 miles on my 26.2th birthday – a few years ago, I’ve been running my age in miles for every birthday. Here’s some pictures from 29. The whole beach was covered in sand dollars! Starting out in the morning. 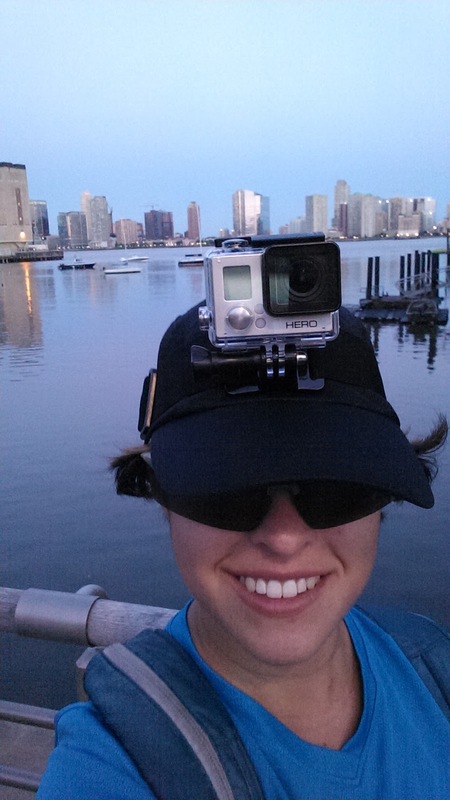 This GoPro is definitely a fashion statement. Today is my Marathon Birthday – I’m turning 26.2 years old (the .2 is 20% of a year). 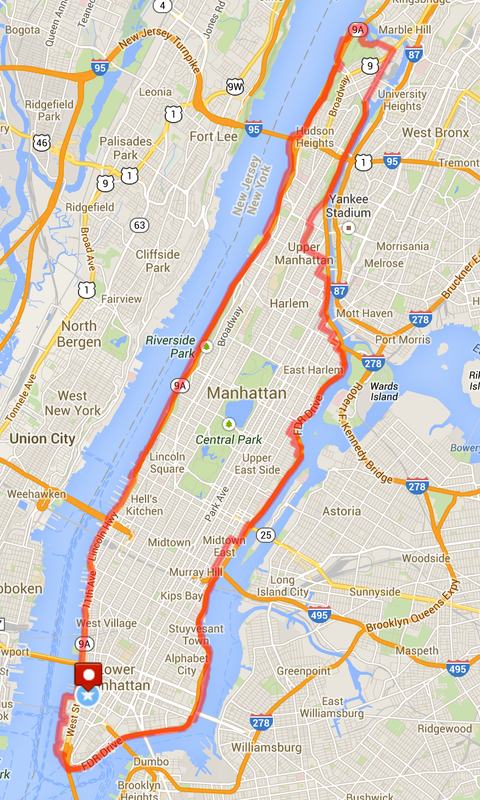 To celebrate this holiday that I have made up, I decided to run around the island of Manhattan – about 32 miles. I also used a GoPro to make a video about it – check it out above! I’d run many of the paths around New York before, but there were some parts I thought would be tricky from a navigational perspective. I conveniently found this grassroots ultramarathon organized last year – the Madhattan – where 50 people ran the the same self-supported ultra I was attempting. I used their map as a template to help me prepare for the tricker-to-navigate areas, especially the north east part of the island, where the trail on the east side of the island ends. This is where I started. I took this with my Android phone! With these encouraging words in mind, I started running from the West Village area about 5:15 in the morning. I’d decided early on to run counter-clockwise, because the Staten Island Ferry area – where people go to visit the Statue of Liberty – becomes impassible to pedestrians by about 8am on the weekends due to mass quantities of tourists. I also started early because this was my first time using a GoPro camera, and I wanted to capture pictures of the sunrise. Heading north along the East River was gorgeous – the sun was just rising, and the first 7.5 miles were along a well-marked trail that I was familiar with. I had to jump off for a bit and onto 1st Ave due to construction, but was back on the trail within a mile or so. I also noticed a bit of a headwind, which I hoped would pick up on the way back down and give me a boost going the other direction. I saw almost no other runners or cyclists out. Sunrise at the southern tip of Manhattan. Taken with GoPro and edited in Lightroom. This camera is legit. After about 120th Street, the trail along the water ended and I moved onto the streets. It was still pretty early at that point, so there weren’t a lot of people or cars – I could basically jaywalk against red lights. I picked up the trail again and took it most of the way up to the northernmost tip of the island, where I ran an extra two blocks and almost crossed Broadway Bridge, leaving the island. Fortunately, someone gave me directions to Inwood Hill Park – northwest part of the island – which I immediately also failed to follow correctly. I somehow ended up on the wrong side of the fence protecting Columbia’s football stadium, and, instead of running around again, just climbed over to escape. Clearly, the well-meaning cyclist from above had never met someone with as bad a sense of direction as I have. Inwood Park was beautiful. So lush and green – there was even a little part where I got to run on dirt trails for a bit! This part of the run also threw into sharp relief the fact that New York City smells really bad in a lot of places. 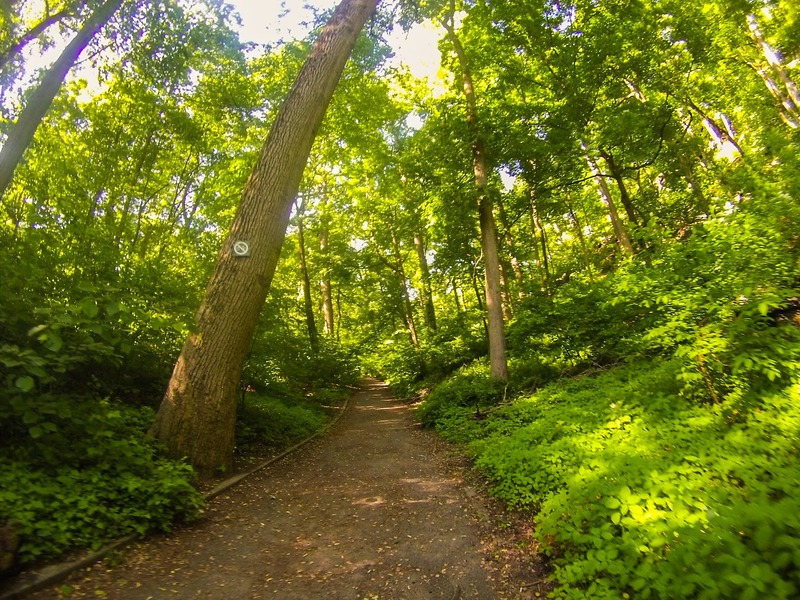 Inwood Park smelled fresh and foresty – such a nice change. Trails at Inwood Park, next to Columbia University. I’d love to run more of these trails before the summer is over – so beautiful. Shocking zero people, I got lost in the trails and asked a guy for directions to the Hudson River Greenway – the path that goes along the west side of the island. He pointed me in the right direction. I did this part a little differently than the Madhattan runners did – I ran about the same distance, but a slightly different route, due to my great navigational abilities. The route I was attempting. Click to enlarge. Immediately after leaving the park, just after mile 20, the battery on my GoPro died. Fortunately, I had been forewarned of the device’s short battery life, and had brought two backups. This also provided a good opportunity to eat my sandwich. Since I still wasn’t clear on where the Hudson River Greenway was, I looked around for someone I thought might give me some additional guidance. A woman on a bike was nearby, and, deciding she was a likely candidate for solid information about bike trails, I asked her. She gave very good directions. Once on the path, it was a straight shot back down to West Village. The last ten miles weren’t overly challenging, although my feet were in a bit of pain from the sidewalk pounding. I was fortunately aided by a tailwind – the previously identified breeze had picked up quite a bit, and my speed picked up (a very small bit!) as well. By this point, it was midmorning, and a lot of walkers, runners, and cyclists were enjoying the good weather. However, the trail was wide and I was familiar with it, so it wasn’t difficult to avoid other pedestrians. Other pedestrians out in the wild. About four and a half miles out, I passed the yacht club – I use that as a waypoint on a lot of my runs. There’s a family of Canadian Geese with two little baby goslings – they were swimming around in their normal spot. The last two miles were probably the most difficult. This was territory I was familiar with, so, while I wouldn’t get lost, it wasn’t visually exciting. My ankles were also very sore by this point. During these two miles, I really appreciated the loud city noise and the fact that it’s pretty par for the course for New Yorkers to talk to themselves; I made up some pretty terrible songs, which I sang to myself, during these last few minutes of running. My improvisational musical abilities spanned topics as diverse as the number of miles I had left, the neon yellow shoes of the guy who just passed me, the number of miles I had left, the kid on the bicycle who just passed me, and the number of miles I had left. I told myself that people were looking at my head-mounted camera, not my crazy talking-to-self tendencies. I finished right back where I started, with a view of One World Trade Center and the Statue of Liberty. After turning off my GoPro, I made a beeline to the nearest Dunkin’ Donuts. Putting together the video was a lot of fun, too. Somehow adding music to pictures is weirdly inspirational. Overall, this was a really fun run. For people interested in doing it, I’d advise you to spend some time with the maps of the area – that helped me avoid a lot of possible extra miles. As for me, I like getting back to leisurely long runs, where I don’t have to worry about time and can just enjoy the scenery and the feeling of taking on a new, and sort of crazy, challenge. Check out the GoPro imprint on my forehead! Scenic Lake Chabot! Credit to ebparks.org for the photo. Some runs are quiet, pensive, and lonely. During some races, you might not talk to someone for hours. Lake Chabot 50k on Saturday wasn’t like that at all. The scenic and flat course attracted a lot of runners; I don’t think I ran a single mile without conversation of some sort. Sometimes, the lack of alone-time while running can be difficult – it’s hard to get in the proverbial “Zone” – but, in this case, that friendly camaraderie was just what the day called for. Beautiful scenery and friendly runners kept me moving to one of my fastest 50k finishes ever.